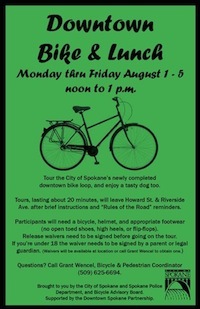 I decided to take up the city of Spokane's offer of a tour of the downtown bike loop and a free lunch to go with it. Thanks to the article in Tuesday's Review they had about 25 people show for the tour that day. Today, Stephen Fortunato of the Bicycle Advisory Board, led 11 riders on the tour. Grant Wencel, Bicycle-Pedestrian Coordinator for Spokane, provided a map of the route and information on bike-related laws. While I've known about bikes being banned from downtown sidewalks I was not aware the fine for violators was $103. While Grant was telling us about this, as if on cue, a young lady rode down the sidewalk on the other side of the street. She wasn't wearing a helmet either. That's $52. We fell in line behind Stephen and headed south on Howard and then turned right on 4th. See that stop sign that's almost hidden by the Do Not Enter sign? It's on the left side of the island but the bike route angles to the right, across the street, and onto the sidewalk. Thus, it's easy to miss. And we did. We all blew right through it. So be careful there. After taking Riverside, Lincoln, Main and Howard back to the start, we were treated to a hotdog, chips, and ice-cold soda courtesy of Downtown Spokane Partnership. Thank you. Tomorrow at noon is the last tour. It takes all of 20 minutes. You get a free hotdog and a drink. Don't forget to wear a helmet. What Do The People Who Count Think?